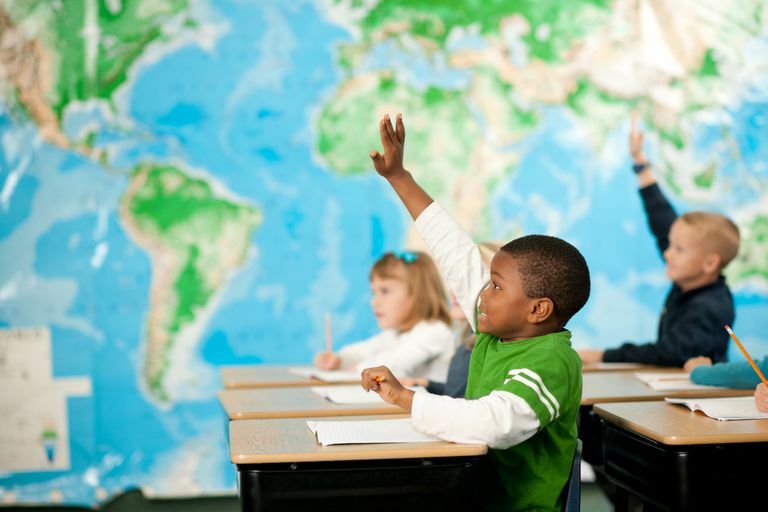 In the United States, the lessons and topics in the first grade school curriculum vary state-by-state. However, there are common themes and subject matter that have been set by state governments, school districts, and national associations to ensure children will meet overall educational standards. The standardization of the school curriculum was designed to address what students are expected to know and understand by the time they graduate from high school. Though children in the first grade are young, the core concepts covered in the curriculum—as with that of any grade—work within a larger framework to ultimately prepare students for college and career readiness at an internationally competitive level. First graders are typically six or seven years old and, generally, have some basic reading knowledge. The planned curriculum for this age group has first grade teachers challenging their students to learn more and build on skills introduced in kindergarten. First grade is a year to explore and introduce the concrete building blocks of math, which include problem-solving, operations, and number sense. Last year, your child may have learned to count with one-to-one correspondence, recognize numerals, and sort into groups. In first grade, your child will continue to build on these concepts using hands-on manipulatives like Cuisenaire rods and snap cubes to more concretely visualize basic addition and subtraction (within a range of zero to 20). First grade is the year when many students seemingly learn to read overnight. By the time kindergarten is over, your child should be able to recognize her name and some other core words in print. She should also be able to write, recognize, and correspond the sound of most of the letters in the alphabet. Even if she is not reading yet, your child likely has a good grasp of concepts about print. Your child's fine motor skills have improved a great deal since kindergarten, providing the control needed to really begin writing. In the first grade, expect your child to begin formal work on handwriting skills in addition to creative writing tasks. Some teachers will focus on inventive spelling, allowing children to write the sounds they hear in words, while also instructing students using weekly spelling words. Your first grader will learn how to use punctuation and capitals, but, more importantly, he will start to use writing as a tool for communication. Your child will spend time learning about plants, insects, and their common characteristics and may even follow the life cycle of a butterfly. He will learn about the external features and environments that help plants and animals thrive. The first grade curriculum covers weather patterns, how they contribute to the water cycle, and how the water cycle sustains life. Simple tools such as a thermometer and wind vane to measure weather conditions are introduced. From there, your child will learn that solids, liquids, and gases have different properties. Other areas of study include learning about the scientific process, such as making and recording observations that include pictures, numbers, or written statements. Expect your child to begin exploring the concept of community beyond just your family. She'll learn about how neighborhoods make up cities, cities make up states, and states make up nations, with a focus on how all of those components work together to create a cohesive unit. For many students, first grade brings a number of field trips to neighborhood businesses and local government and public institutions, like the library. In first grade, your child will begin to identify line, color, shape, form, and texture as elements of art. He will learn to create secondary colors by mixing primary colors and describe the process. The first grade curriculum is designed to meet and advance the skills that are expected of a child this age. Of course, every child is different. If you are concerned that your child is not meeting the markers described above, speak with his or her teacher.